Dudley Creek Lodge est l'endroit idéal pour vous la prochaine grande famille ou des vacances en groupe. Situé à seulement 15 minutes de la station de ski de Big Sky et 19 miles du parc national de Yellowstone cela est l'endroit idéal pour l'été et l'hiver. Dudley Creek Lodge dispose de 6 chambres et 2 chambres avec lits superposés, 5 salles de bains et demi, salle de jeux de billard, grand bain à remous et sauna et 2 grandes chambres. Ce grand pavillon de 10 000 pieds carrés peut accueillir jusqu'à 20 personnes. Le lodge est juste une courte promenade de la Gallatin rivières monde célèbre la pêche à la truite et le rafting en eau et Dudley Creek et votre propre étang privé sont juste à la porte arrière. Wapiti et l'orignal sont des visiteurs réguliers à la propriété, qui est situé à côté de la Forêt nationale de Gallatin. Outstanding property. There were 14 of us and it was quite comfortable. This house! The photos on line do not do it justice. We stayed at many properties in Big Sky and areas around Park City and this was the most well appointed. The kitchen is huge and so well stocked with every appliance and gadget you would need. The only problem we had was the oven doesn't close tightly so it was difficult to maintain a consistent heat level. It was the holidays so I did not report this to the property manager, Tom, who by the way is so fantastic! 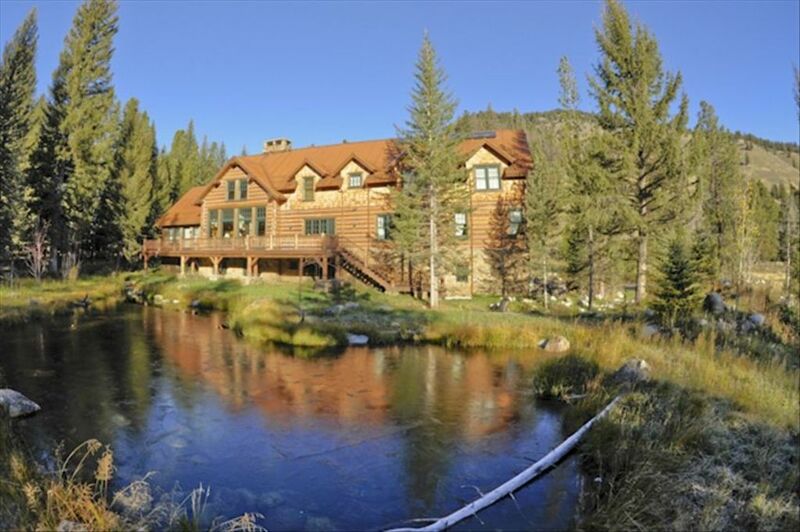 I highly recommend this lovely house for your stay at Big Sky. It was super convenient to the slopes, Big Sky markets and Yellowstone. It's close to the main road but we never heard a single car or truck. Perfect house for a family of 12 adults and a one year old who thought she owned the place. The house was perfect for our family celebration. Well equipped, clean, nicely decorated for the mountains. Our adult children are big hikers and especially loved the proximity to trails and Yellowstone. Would certainly rent this home again. We really enjoyed our stay at Dudley Creek Lodge. Great design. Each family had their own bedroom. The dormitory downstairs was a lot of fun for the kids. Everything in the Lodge was of high quality with a well supplied kitchen. It was the perfect place for a family vacation which included our three children, 6 Grandchildren and 2 Great grand children plus spouses. Plenty of room for all. Tom Newberry made sure everything was perfect and provided a great recommendation for a chef to handle a celebration dinner. Overall it was a great experience. This house was perfect, the area was breathtaking, the rooms were clean and big. The kitchen had everything we needed. Can't say enough about how much we love this house! We got to the west Yellowstone entrance within 45 minutes of leaving the property, but our family really just wanted to hang out in Big Sky because we liked it so much. We were a group of 18, four families coming from four corners of the country, convening in Montana for a week of fun. This house was absolutely ideal. Comfortable, spacious but still cozy. The bedrooms were all so comfortable and well appointed. We had four choosy moms who gave the entire house a big thumbs up. The kids (10 of them) all had a blast too. Location was perfect to access all the activities we did including hiking, rafting, horseback riding and rafting. Highly recommend to any big group or family looking for a great spot to call home for a week in Montana.